Like many women, I own a few handbags and chop and change in between them frequently. Leonie gave me a fantastic handbag organiser for Christmas, which I have stuffed everything that used to rattle around in the bottom of my bags, gathering dust woofees and lint. It fits my normal sized handbags, so I can just lift it out and put it in any of my work or day-to-day bags with ease. When I downsize I face problems, purse, phone, keys or glasses? Or glasses, phone, purse or keys? You get the picture. I went to Chadstone to buy some shoes yesterday, my favourite jeans were in the wash so I had to wear my 3/4 length tucked into brown boots, (which I seem to live in when I am not at work), so had to swap from my Mulberry black bag which is on an extended outing for the past 3-4 weeks, into my brown bag. Going to the MCG last night, I had to swap everything back again, as I wore a black suit and one of my two pairs of new shoes. Hurrah, a successful shoe shopping trip, that doesn’t happen very often I can tell you. When we got there I was rummaging around for my purse so I could go to the ATM, as despite me going to the largest shopping centre in the Southern Hemisphere, I’d forgotten to get any money out. I reached in and realised that although I had transferred the organiser over, I hadn’t put anything else back into the black bag. I thought it was light. If I needed a tissue or a nail file, I was fine. If I needed some money, which I did, I was stuffed. On the right is the organiser, and yes that is a diary, and 2 notebooks, one for home and one for work. Plastic wallet for paperwork I collect on my travels. Copious amounts of smellies, spare contact lenses, sunglasses, painkillers, green tablets are anti0biotics, dried fruit and nuts in case I can’t eat wherever we’re at, purse, iPhone. When it’s all packed it weighs over 3kg. I am pleased I drive to work. Love the pic! 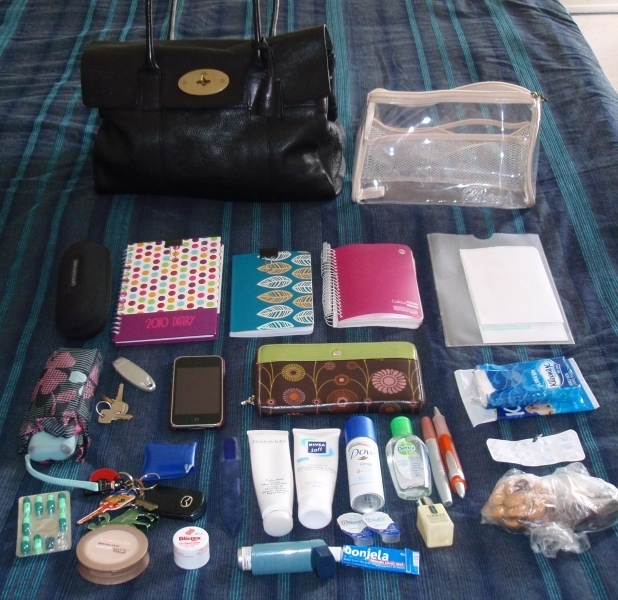 1) not sure you know how to travel light, just like me :o) and 2) your contents look like mine. I’d love to change my bags more frequently, but it’s the hassle of swapping over, and it doesn’t surprise me that you left something behind….